Available in all superstores nationwide. You can also buy it online from Just4girl.pk or Mascara Mafia. 9 varied shades that come in a 4.5g pan with a transparent lid! Color Studio Pro never fails to please us with its affordable beauties! The Eye Inks are available in 9 gorgeous shades, out of which I received Purple Dust, Fairytale Blue and Moon Dust. The best thing about Color Studio is their quality, budget-friendly products. These Eye Inks are again one of them. They blend easily, have the silkiest of texture and minimum fall out. The texture was what amazed me the most. Smooth and silky-soft! The pigmentation is pretty good too as you can see the swatches are without a primer but the intensity needs building up. I swiped 2-3 times. 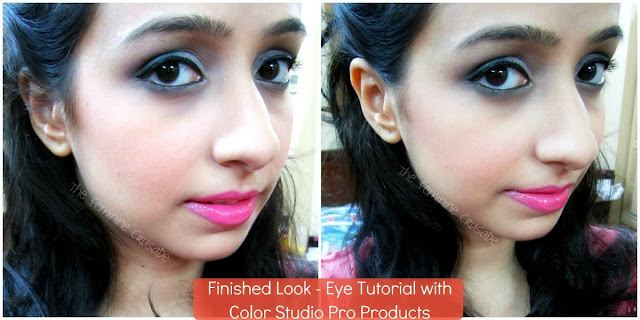 To make the colours really vivid and long-lasting you definitely need a primer underneath. Overall, I think these eye shadows are a great investment and some of the shades are really worth having. I am also thinking of buying some more especially Jungle Green, Razzle Dazzle and Carbon Black. This look was created with these three Eye Inks. Click here to head over to the complete tutorial. Good quality, silky-soft, affordable eyeshadows!